MILWAUKEE, Wis. (October 19, 2016) - Brady (NYSE:BRC), a global leader in industrial and safety printing systems and solutions, today announced that its aerospace RFID (radio frequency identification) tags have been approved for use in Boeing’s commercial airplane programs. These tags include both Brady's on-metal and off-metal tags that are used to wirelessly identify flyable parts throughout an aircraft and track information about component history. The tags leverage Brady’s high-performance materials designed to resist exposure to extreme environmental conditions for aerospace applications. Tags include Brady’s Alloy Tag, for on-metal applications, and Air Tag, for non-metallic surfaces such as life vests, safety equipment and other in-cabin moveable assets. 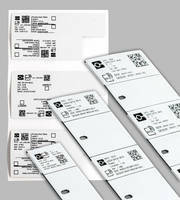 The RFID part tags have been included in Boeing's BAC5307 part marking specification, and meet Boeing specification D6-84731, SAE Specification, AS5678 and Air Transport association (ATA) Spec 2000 chapter 9-5 requirements.